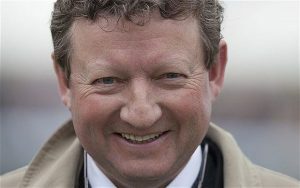 Mark Johnston is a Scottish horse trainer based in North Yorkshire. Unlike some well known trainers he had no prior career as jockey and instead made moves to become a horse trainer following completing his Vetinary degree in Glasgow. It has been his plan since the age of 14. Johnston’s Father owned horses, and this is often cited as his initial point of interest in both horses and racing. He begin training at an unassuming Lincolshire stable in 1987, before moving to Kingsley House, Middleham the following year, a location with many more modern facilities. His first winner was Hinari Video over 5 furlongs at Carlisle. He went on to run 126 races, winning 11, bringing home to the trainer what was possible in the sport. Bouyed by the fact that the winning races was not beyond him, Johnston went from strength to strength. A noteable winner he trained in these early years was Mister Baileys, winner of the 2,000 Guineas in 1994. This was the year that a trickle became a flood, with 100+ wins in every year since, and even over 200 in some. An Ascot Gold Cup win with Double Trigger (who won 13 other races) and in 2004 won the 1,000 Guineas with Attraction came in the following years. Johnston looks fondly upon these times even today with him listing Mister Bailey’s win, and Double Trigger Royal Ascot win as his top career highlights in a recent Sporting Life piece. As demonstration of his staggering success in the sport, Johnston earned his 4000th win in 2017, a figure most trainers could only dream of (the feat has in fact only been attained by two other horse trainers, Richard Hannon snr with 4,193 wins, and Martin Pipe with 4,183). In August of 2018 he topped Hannon’s total becoming the most success trainer in history with the win on 20-1 shot Poet’s Society ridden by Frankie Dettori at York.